Are you the type of mom that meal plans and prepares all her meals from scratch? I wish I was. After having twins and starting my own freelance writing business, I realized how little time I have to do anything. My glasses broke in December. It’s March and they are only being held together with glue. I finally went to the salon to get my hair cut. I think it has been over seven months since I last went. Sure, I have help everyday and my husband works from home, but my twins are my life. I take care of them, feed them, wash them, play with them and teach them. So, while I am very much capable of cooking, I don’t do it as much as I’d like. And my twins aren’t the best eaters. So my daughter is the better eater between the two. She eagerly tries new foods and eats a variety of fruits, vegetables, meats and carbs. My son, on the other hand, is a very cautious eater. He is hesitant in trying anything new and before he does, he has to see it, touch it, smell it and be exposed to it dozens of times before he even attempts to try a new food. Because of this, his diet is limited. So, finding food that the whole family likes and will eat is a huge challenge for me. So I shoot for dinner time where we all eat the same food. Breakfast and lunch, the kids can choose what to eat or I feed them something I know they will like. I also know that this is just a phase. I hear stories all the time of when such and such was little all they ate was peanut butter and jam sandwiches until they were eight. So, even though my son’s lack of trying new foods keeps me up at night, I know he’ll eventually outgrow it. Both my twins drink only milk or water during the day. It’s rare if they have apple juice. My daughter doesn’t like much sweet things so prefers milk or water most times. 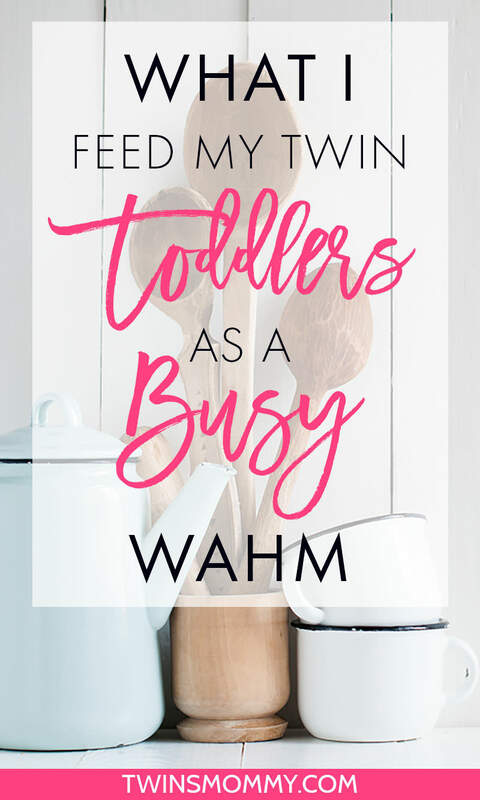 I feel that my job is to only expose my twins to different types of foods and model for them trying new foods on a regular basis, rather than force them to eat new foods. So, want to see what my twins will eat in a typical day? About a half hour after they wake up, my twins have a cup of warm milk. Then about an hour after this, they have their breakfast. 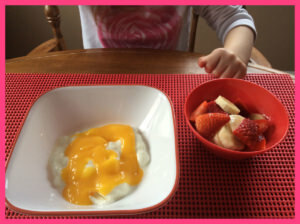 For this meal, they chose plain yogurt with mango sauce I made and I served a fruit salad of bananas and strawberries. They had water to drink. They ate one or two bowls of both yogurt and fruit salad. Lunch is typically easy going. Before lunch we are either playing around or outside bike riding, walking or shoveling the snow banks. This usually means lunch is easy and quick. I don’t typically eat the same lunch as they do. I might eat sushi, a sandwich, egg burrito or leftovers. Lunchtime is also when I like to introduce new foods to the twins. This is because there’s more time in the day for reactions from eating new foods. For this lunch they had Italian Wedding Soup (not homemade. I’ve made this soup in the past but the twins didn’t like it. Go figure) with crackers, cherry tomatoes, carrot sticks and snap peas. My son only ate the tomatoes from the choice of veggies I gave them, but my daughter loved the snap peas the most (but also ate tomatoes and carrot sticks). Both my twins finished their soup and even ate the meatballs. They only ate one cracker and ate all the tomatoes. My daughter also ate some snap peas and a carrot stick. I ate the remaining veggies. Then we had a “juicy orange” afterwards. 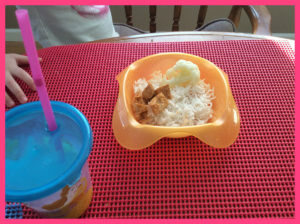 Today we had an easy dinner – Butter chicken with rice and cauliflower. For dessert the twins had fruit. But, dinner time is when I have the most time to actually cook something. I sometimes alternate with my husband and we take turns hashing something up for the family. 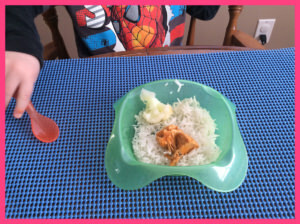 My son ate all his rice and tried two bites of chicken and only touched the cauliflower. My daughter took a bite of cauliflower, ate most of her chicken and had a few spoonfuls of rice. After dinner they had blackberries. I hated that my son would only eat bread and fruit and barely touch his chicken or beef. I hated that I can’t just make shrimp pasta or chicken Alfredo or spinach lasagna because my twins won’t eat it. I used to beat myself up about this, but I eventually learned to just give that up. I work from home and I don’t have the time to cook elaborate meals. I’ll crock pot a meal, bake chicken or whip up a fast pasta sauce and be okay with that. I’m even okay using boxed or jarred food. I know my twins are happy and are eating a fairly good diet.They don’t eat junk food or eat many sweets and they rarely have juice. We provide probiotics, vitamins, fish oil, an iron supplement and do our best to expose them to a variety of vegetables and other foods. 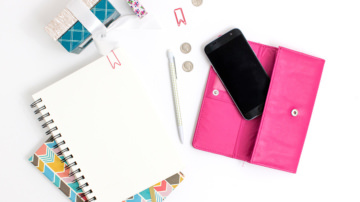 Over to you – do you work from home? If you do, what are your go-to meals for your family? Let’s share our what we eat for dinner for inspiration. I love your blog and am trying to start mine. It is alot of work! I too have 2 kids (19months and 6 yr. old) and its difficult to carve out time to work on it at times. 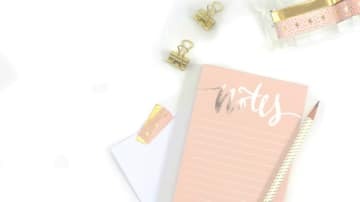 I’m staying at home now from teaching since my husband will be deploying out to Afghanistan and I’m hoping blogging will provide a little sort of income for me. Your website has truly help me. Thank you and God Bless! Love your blog’s design! Very cute! Thanks for stopping by. Congrats on starting your blog mama!!! I love reading how other moms (esp. twin moms) are handling mealtimes. I feel like my entire life revolves around feeding my girls. 😉 As of now, a good 25–50% of food winds up on the floor. Ah, well. My main “trick” is to sneak greens into their diet via smoothies. Put them on the plate and I’ll be sweeping it up ten minutes later. . . but in a sippy cup, it’s all good. Thank you, and I agree with you when you say not to beat yourself up if your little has a only a handful of foods they will eat. My son decided to get picky when his molars started pushing through and hasn’t gone back to his carefree eating habits. But I’ve found the “handful” of foods he will eat and try to vary it up for him. I believe that it is perfectly ok if you let them eat the foods that you know they will eat and add in one new food that they may or may not eat at each meal. That way you will slowly expand the foods they will eat! If they are old enough to reason with you could let them know that they don’t need to eat all of the new food just to take one bite and they can leave the rest of they don’t like it. My son would eat sausage, rice and peas for every meal and not complain! Thanks and you’re the first commenter! Whoop whoop! 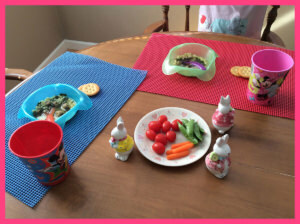 Yes, my twins just turned 4 and they are doing okay with eating newer foods. 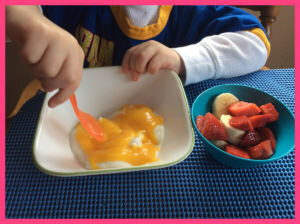 My son is the pickiest but he loves plain yogurt, chickpeas, milk, some soups, broccoli and fruit. My daughter’s diet is a bit more varied, but I’m glad they are at least trying some new foods occasionally.